School of Computer Science & Engineering, South China University of Technology, Guangzhou, China. Received March 11th, 2010; revised April 2nd, 2010; accepted April 3rd, 2010.
can be split by four ways: 16 × 16, 16 × 8, 8 × 16 and 8 × 8.
and all the DCT residue blocks [4,5]. 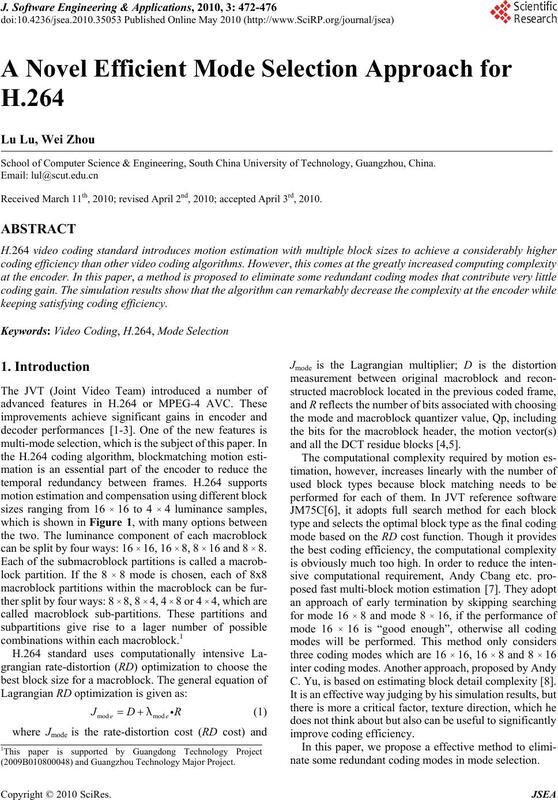 C. Yu, is based on estimating block detail complexity . nate some redundant coding modes in mode selection. (2009B010800048) and Guangzhou Technology Major Project. 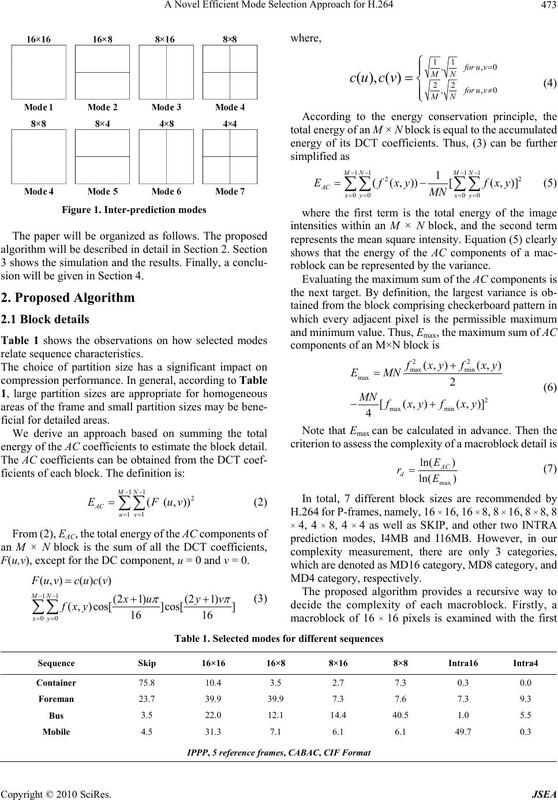 sion will be given in Section 4.
energy of the AC coefficients to estimate the block detail. F(u,v), except for the DC component, u = 0 and v = 0.
roblock can be represented by the variance. the proposed algorithm has to check. 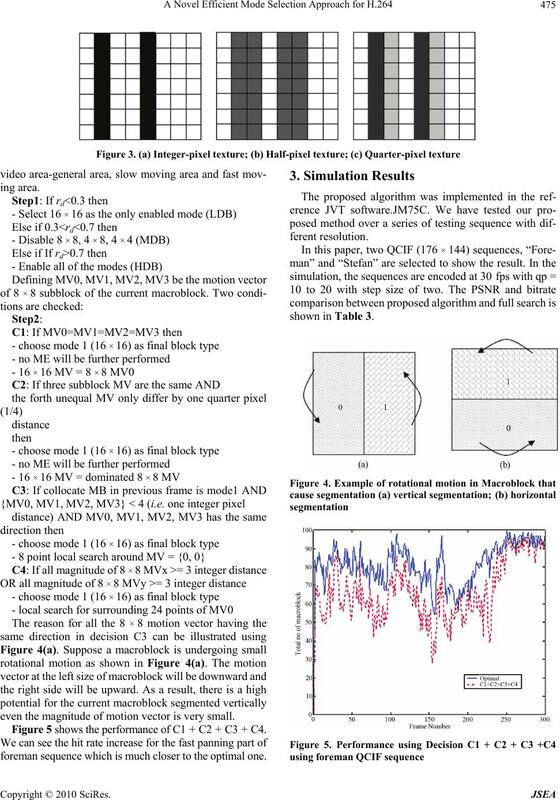 be predicted perfectly by integer-pixel motion estimation. to difficulty in motion estimation. relative to the sampling grid. texture and sub-block 1 contains “integer-pixel” texture. roblock, searching will be stopped immediately. 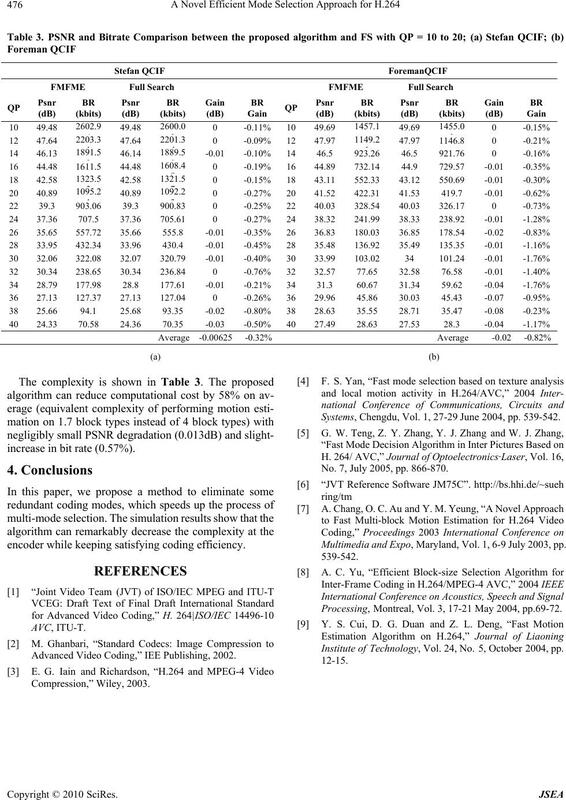 even the magnitude of motion vector is very small. Figure 5 shows the performance of C1 + C2 + C3 + C4. foreman sequence which is much closer to the optimal one. increase in bit rate (0.57%). encoder while keeping satisfying coding efficiency. Advanced Video Coding,” IEE Publishing, 2002. Systems, Chengdu, Vol. 1, 27-29 June 2004, pp. 539-542. No. 7, July 2005, pp. 866-870. Multimedia and Expo, Maryland, Vol. 1, 6-9 July 2003, pp. Processing, Montreal, Vol. 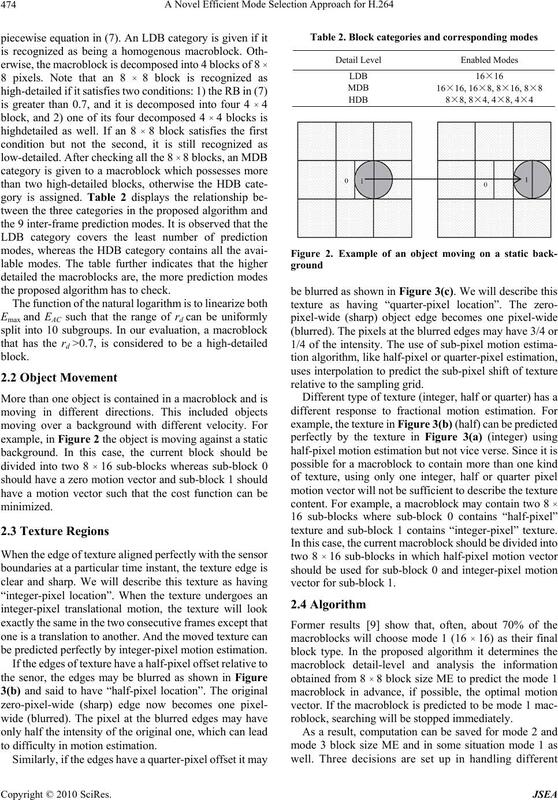 3, 17-21 May 2004, pp.69-72. Institute of Technology, Vol. 24, No. 5, October 2004, pp.